Counterfeit Christianity is likened unto a stress ball, thought-up, premeditated and invented in order to warp unto manipulation... coddle unto pacification...seduce unto betrayal...bribe unto deception...delude unto delusion...entice unto ensnarement...and lastly, to entrap one in a "salvation" that leads to hell. What makes Counterfeit Christianity so dangerous? Because one who relies on a counterfeit while under the impression it's authentically real, will NEVER have a re...ason to seek out the real thing. What you lack...you think you already have. Counterfeit Christianity: The destruction of Christianity BY "christianity". 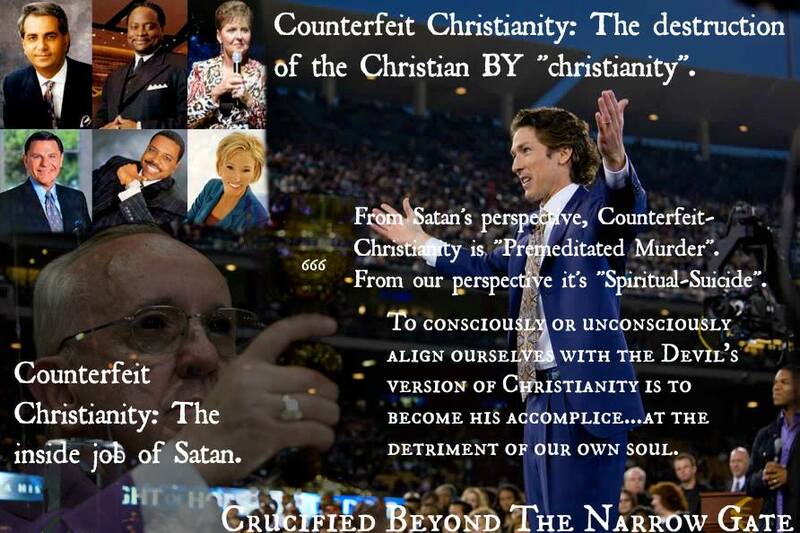 Counterfeit Christianity: The inside job of Satan. Counterfeit Christianity: A ticket to heaven on a one way road to hell. Counterfeit Christianity is the immediate effects of the personality disorder of Satan. Counterfeit Christianity is a murderous, psychopathic-serial killer. Counterfeit Christianity is meant to distract you from the fact you LACK what you are being told you have. Counterfeit Christianity is the Stress Ball of Satan. Counterfeit Christianity is the reverse psychology of hell itself. Counterfeit Christianity, Catholic AND Protestant alike, is the Whore of Babylon we are told to have NO part of (Revelation 13, 17 and 18). Babylon is a system stemming from Roman Catholicism...and this system, like a parasite, has spread to the four corners of the earth. Soon this system will unite all religions, making the magnum opus of Satan's master counterfeit complete. While God is calling His children OUT of Counterfeit Christianity, see how many are going IN! (Pope Francis is hard at work uniting Protestants with Catholicism as we speak). The seed of the Mark of the Beast is discreetly and deeply sown within the soil of Counterfeit Christianity. This seed is being watered by false teachers and is growing unto the full manifestation of The New World Order of Antichrist and his soon to come One World Religion. This system has firmly taken root in and among the Modern Church for this very purpose. THIS IS THE APOSTASY Paul said MUST take place before the Return of Christ can happen. 2 Thessalonians 2:3- The days in which we live are surely the last! If you refuse to shed and empty yourself of Counterfeit Christianity it will cause you to shed and empty yourself of Christ.